930am: Come face to face with a giant galvanised steel cow. Sounds like an interesting day, right? We made the trip over to Bolton Abbey for a special unveiling. The magnificent galvanised steel sculpture of the Craven Heifer was unveiled yesterday, to celebrate the 160th Great Yorkshire Show this summer. Show organisers the Yorkshire Agricultural Society commissioned renowned Whitby-based sculptor Emma Stothard to recreate the Craven Heifer who became a national phenomenon in the 1800s. People would pay to see the heifer who was put on show on her way to Smithfield Market, London, and remains the largest heifer ever shown in England and lived in the same era as the first Great Yorkshire Show. Weighing more than half a tonne and standing at 6 ft tall, the GYSheifer sculpture was launched from the Craven Heifer’s birthplace on the Bolton Abbey Estate by the Duke of Devonshire and the Show Director Charles Mills. Charles Mills, Show Director, said: “Today has been a momentous start to our 160th anniversary celebrations and marks the launch of tickets which go on sale today. Today’s journey from Bolton Abbey to Imphal Barracks marked the launch of tickets for the show which takes place from Tuesday 10 to Thursday 12 July. 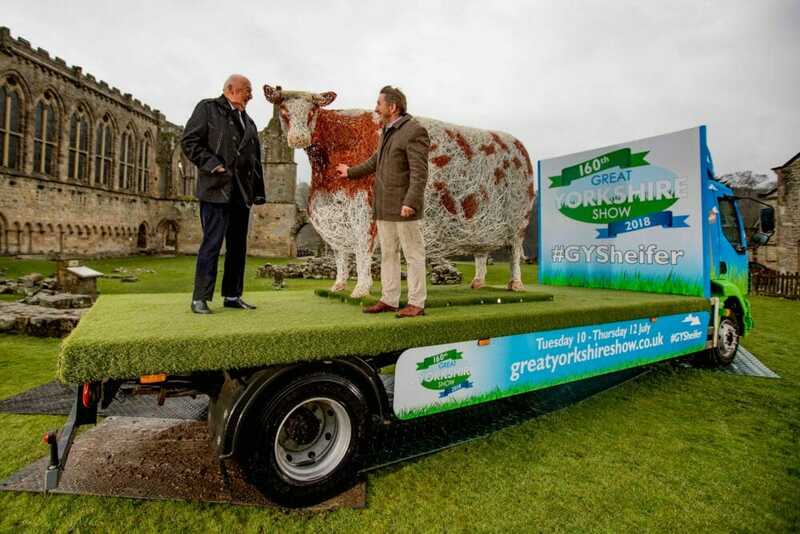 The GYSheifer will now pop up at locations across Yorkshire to promote England’s biggest and best agricultural show before taking up position at the Great Yorkshire Showground ready for the event. The GYSheifer is a one off, bespoke, life-size sculpture in steel which stands 6ft high, 4ft wide and 11ft long. She was created at sculptor Emma’s Whitby studio before being galvanised in Bradford and powder coated in Middlesbrough. 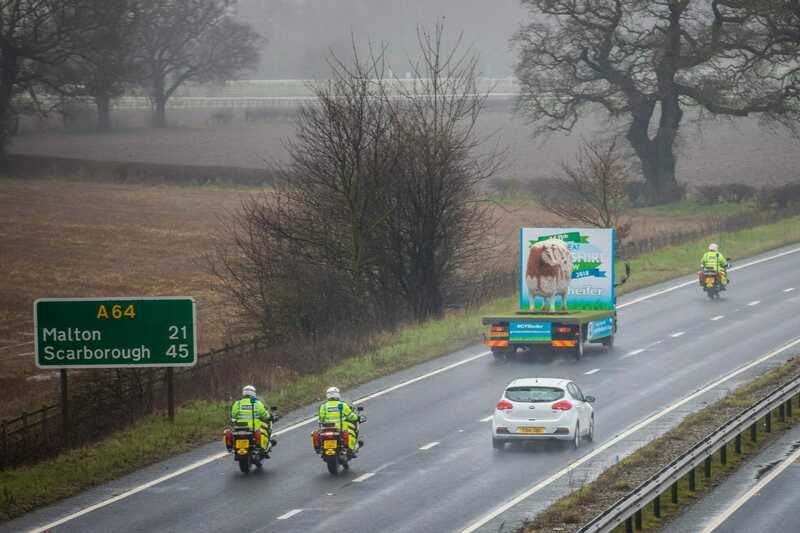 She was then attached to a specially designed Great Yorkshire Show truck by HACS construction services in Ripley – ready for her journey. The Craven Heifer was born and bred in Bolton Abbey in the early 1800s. She was so large that a special door twice as wide as the norm had to be built to get her in and out of the cow shed. This doorway can still be seen on the Bolton Abbey Estate to this day. The Craven Heifer was a Shorthorn breed and this year will be the first time that the Great Yorkshire Show will host three national cattle breed shows; including the UK Beef Shorthorn Championships the British Simmental Society Show and the National Charolais Show. 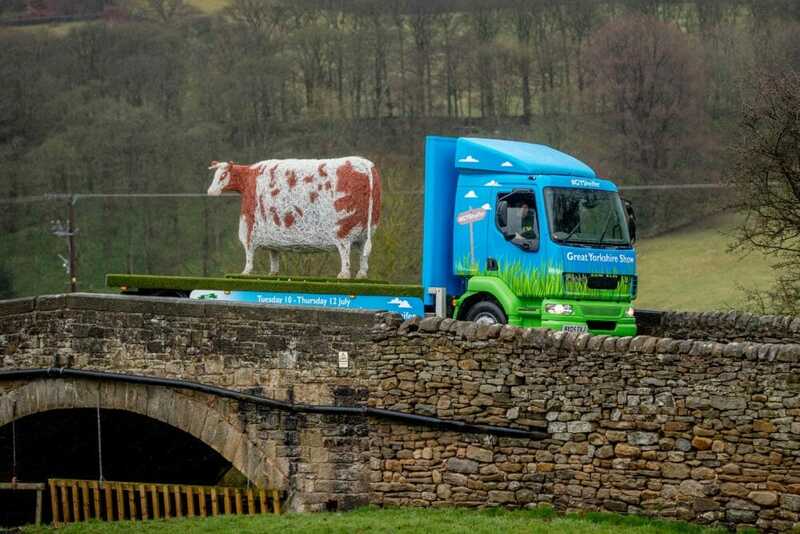 The GYSheifer will now go on tour, appearing at the Yorkshire Sculpture Park on Friday April 13 and travelling around the region until her final visit to Our Cow Molly Farm Shop in Sheffield on June 10.The public are encouraged to post their selfies with #GYSheifer on Twitter. The best picture from each location will win a family ticket (2 adults & 3 children) worth £75 on the door, £65 in advance. All photos credited to The Great Yorkshire Show and Charlotte Graham.